Two years after waiting at the altar for Keith Mitchell, Cara isn't ready to meet him again, much less work with him as the consultant on her bridal fashion show! For his part, a misunderstanding sent him running, but now that he knows the truth, and they're spending long days working together, he wants her back in his bed. Will Cara use their passion to gain the ultimate revenge? Let the newlywed games begin. This is the second book I've read by Kat Cantrell and I am so glad I moved on to this one! Keith left Cara on their wedding day, following a conversation they had, minutes before they were supposed to get married. Cara always dreamed about her perfect wedding and being married, so she believed it was a personal failure that her dream fell apart. Two years later, Keith is working as a resort consultant and he has to put together a bridal expo, so he hires Cara's company. Cara never saw it coming because her sister, Meredith (who is getting her own book, YAY! ), doesn't tell her Keith was the one who hired them. So, now they have to work together on a romantic island. [WARNING: possible minor spoilers] I think the story started off a little shy but it just kept getting better and better. My first impression of Keith wasn't good. I thought that he was an arrogant rich boy, I mean his opinion on Cara, until they were stuck together in the elevator, got a little annoying. But then he kept surprising me with his thoughts and his interactions with Cara. Let me just say, Cara is probably one of the best female characters ever! I loved her, loved how she kept Keith on his toes and how she remained true to herself. it was funny how he didn't even know which way was up whenever she was around and I liked that Cara didn't fall for his smooth moves too soon. It was kind of perfect how they slowly let each other in. I do love second chance love stories and Kat Cantrell definitely delivered a beautiful one. Can't wait to start reading Meredith's book. I received a copy of this book for free, from the author, in exchange for an honest review. Reunion stories are so much fun. 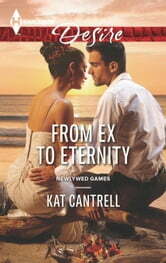 With From Ex to Eternity, Kat Cantrell created a story that has all the elements of a fun entertaining read. Exes who did not end on the best of her terms are thrown together on a romantic island getaway for work. I was given an ARC of the story and found it to be a funny fairytale that touched the romantic in me. Loved the story.